Thank you Sean for your dedication and your sacrifice to protect the people of Mass. We honor you and thank you for service. Love and prayers go out to you and your family. Thank you for your bravery. We come to MIT to study and develop ourselves and we are really grateful you are there to support and protect us. Our world was better because you were in it and your lasting memory will continue to make it so. Thank you. My sincere condolences to the family for raising up a brave man who died to protect us all. Farewell and Godspeed Sean. Thank you, Sean, for your service. You were too young to leave this earth so soon. My heartfelt sympathy for the family you left behind, may God comfort them and give them peace. I did not have the fortune to meet Sean Collier; my loss is all the greater as I will never be able to meet this remarkable young man. My condolences to his family and friends. It's so sad. Words seem so empty... Very hard to find the words needed to say what's on your mind. I deeply feel with the family, the fiends, colleagues. My prayers are with you all! Dear Sean! Thanks for your service. That you went out there to serve the people, to serve your country. You will not be forgotten! Rest in Peace Sean. You will forever be in our hearts. This is a terrible loss to the MIT Community. I've been an admin at MIT nearly 30 years and have always found campus police to be helpful, particularly when one of my postdocs was being stalked some years ago. It is a sorrow-filled time, just awful. My condolences to your family, Sean. You have the the biggest heart and most brilliant smile. You certainly lit the Salem State Campus. Thank you for your selflessness and bravery. Heartfelt sympathy coming to Sean and his family from Buffalo, NY. We are heartbroken for you all. May God Bless you all. God Speed Sean. RIP- you are a hero to us. My heart breaks for the Collier family. Please take some small consolation in the fact that he was doing what he loved; probably what he was born to do. I can only think of the prayers I learned as a child ... "Grant rest, 0 God, to Your servant, Sean, and place him in paradise where the choirs of saints and righteous shine like stars. Eternal memory." (From the Byzantine prayers for the deceased.) Eternal memory. Heaven gained and angel and Boston lost one of its finest. 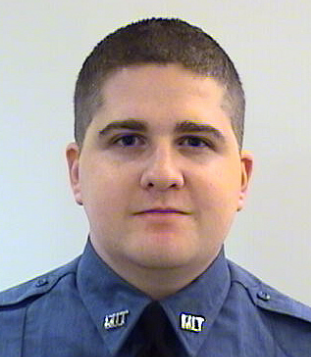 RIP Police Officer Sean Collier. You were a true American hero and will always be in our hearts in Boston. To your family, I am truly so sorry for your loss and you will continue to be in my thoughts and prayers. <3 Boston Strong. My daughter is 9 and was so sad to hear that we lost an officer. She is also praying for you. I still don't have the words to say because it still doesn't seem real to me. Sean, I have always known you were the most amazing guy I had every met and I'm so grateful to have had you in my life. I only hope that your family can find comfort and solace in the fact that you are a true hero and will be remembered that way forever. My deepest heartfelt condolences go out to the whole Collier family and you raised an amazing man. My deepest condolences go out to the Collier Family. I am truly saddened and heartbroken for your loss. Although there are no words that will help ease the pain, please know that Sean will forever be remembered as a hero and will always be in the hearts of those who knew him. I hope that your family finds the strength to make it through this very difficult time. Thank you for proving to the world what it means to be a true hero. You made the ultimate sacrifice to keep us safe. You are a true Viking and make Salem State University proud. My deepest sympathies to Officer Collier's family and his MIT Campus Police colleagues. MIT is a better place for having Sean Collier in its community. Words can't express how saddened we are to hear of your loss. May the love of those around you help you through the days ahead. Our Sons, our Daughters. They are the soldiers of the street. They've come to fight a different war, one of guns and drugs. Each night before they work the streets, they leave us with kisses and hugs. We pray for their safe return which God so kindly gives. And allows them to share another day with their loved ones, families, and kids. But then that dreaded day arrived, and the enemy he did meet. And with the courage of ten good men, he did battle in the street. Our soldier fought so hard and long. The battle was so fierce. And even though he showed such strength, he body still was pierced. His soldiers came, they tried so hard to keep my soldier here. But God so gently closed his eyes, something we all fear. They came from all around the world to bid my solider good-bye. And even though I believe i God, I still ask the question, Why? My soldier didn't come home last night, and now I'm all alone. I no longer fall fast asleep knowing he's safely home. Although I have this tragic loss, I hold my head up high. For I know he laid down his life protecting you and I.
I cannot bring my solider back, even though I secretly try. I must believe he"s in a better place and fro this I cannot cry. Thank you so much for protecting our campus. My sincerest condolences to the Collier family. Officer Collier's memory will live on at MIT as we honor his heroic service. God bless you & thank you for your bravery & dedication to duty. May God bless your entire family & comfort them with love & understanding. You will be in our prayers & may you be in the loving arms of our creator! RIP, sir. Thank you for making the ultimate sacrifice for our city. We won't soon forget you. My deepest condolences to the family of Sean and to his fellow officers. We are blessed to have had Sean protecting MIT.